Exclusive Excerpt of Kresley Cole's THE PROFESSIONAL PART 2! What, you thought just because X-mas was over we wouldn’t still be in the giving spirit? I woke in one of the yacht’s cabins, tucked under the covers. I had vague recollections of repeatedly jerking awake against Sevastyan’s side, until I’d gone under for good. He’d moved me? And changed my clothes? I was dressed only in one of his undershirts. It was still dark outside, but I had no idea what time it might be; fall in Russia meant vanishing hours of light. I could tell we were stationary. Maybe Sevastyan had finally come down here to rest. Boom. Boom. What was that hammering sound? I rose to investigate, making my way toward the source until I reached the door to another cabin. When Sevastyan didn’t answer my knock, I eased the door open. I heard the shower running—and the booming was coming from within that bathroom. As a sinking suspicion took hold, I hastened into the bathroom. I sucked in a breath at the scene before me. Naked under the spray of water, with his eyes glazed over and his teeth bared, Sevastyan was punching the stone shower enclosure with his battered fists. The steaming cascade hit his chest as he struck, over and over, as if at an invisible enemy. If he’d been granite under pressure before, now he was fracturing right before my eyes—just like the stone he pummeled. “Stop!” Heedless, I tore open the shower door and scrambled inside, grasping his uninjured arm with both hands. He was a killer, volatile and violent, but I felt no fear of him. Not even when he whirled around on me, black hair whipping over his cheek. He was breathtaking. Real. Raw. That sense of connection to him flared like a blinding light. Between gritted teeth, he said, “Leave.” His amber eyes were filled with such pain. He just stared at me. What was he looking for? Permission? Understanding? Finally he moved, placing his palms on the wall on either side of my head, boxing me in. His mafiya star tattoos were at my eye level, mere inches away, beckoning me. I wanted to wrap my arms around him and press my lips to his chest. Kiss him and kiss him and kiss him until all his pain disappeared. Tentatively, I leaned forward to graze my lips over one of his tattoos. He flinched as if I’d struck him, but he didn’t stop me. I chanced a brush of my lips over his neck. He was motionless, a statue on the outside, a ruthless enforcer on the inside. I nuzzled the rugged line of his jaw. I tugged those locks of hair away from his face, then kissed the chiseled cheek I revealed. Before, I hadn’t slept with him because of the future and consequences. I wasn’t sure I’d live long enough to enjoy the former, so I couldn’t be bothered with the latter. I gasped when he fisted the collar of my T-shirt. “I want what’s mine.” He tore the material from me with one rip, making me tremble. He raked his gaze over my naked body, giving a tortured groan. He looked at me like a man plummeting toward death would look at a pair of wings. As if I were the difference between life or death for him. I laid my palms over his star tattoos; he cupped my face. His forehead met mine. We stayed like that for long moments. When he took my mouth with his at last, I parted my lips in welcome, closing my eyes as he softly kissed me. God, I loved his taste, wanted to drink in the heat of his mouth. As ever, I was struck by the contradictions of this man. He was tender, yet carnal. His thoughts were a mystery, but his body told a story—of his restraint: rippling muscles, heaving chest, shaking hands. With a groan, he flicked his tongue harder against mine, telling me that he was about to deepen this kiss. Telling me that he was about to claim this part of me, with the rest of my body to follow. That he was about to conquer. . . .
Hungry for more? 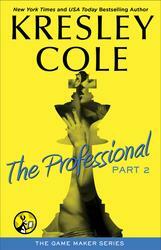 The Professional Part 2 releases January 6th for only $1.99! OMG this is SOoooooooooo HOT!! !